The more people the system incarcerates the more money is being spent to keep them imprisoned but it does not stop the crime from happening on the streets. So the question is raised, Do we need Criminal Justice Reform? The key message in Martin Luther King, Jr.'s "I have a dream" speech is that all people are created equal and, although not the case in America at the time, King felt it must be the case for the future. As Dr. King would not be pleased with the way society is today, I pray that we can come together as one for the sake of ourselves, and Dr. King. Going through my years of high school, I just knew I was not going to be accepted into college. Not because of my academics, but because the record I had followed behind my name like a prisoner--I was a zero tolerance prisoner. Is there a relationship between mindfulness and how we practice justice? I believe everyone involved in the criminal justice system can benefit from mindfully practices. Here is why. Nobody wants to be controlled for his or her whole life. What people want is to feel morally right within themselves. We can use our power (not control) to help others to get there and to change ourselves, as well. Do the activists of the Black Lives Matter movement understand the motives and fight that Martin L. King Jr. stood for? Are they going about matters as he would like them? Though times have changed the fight is still much the same. Do We Need Criminal Justice Reform? YES!! It seems that those in the criminal justice system are unaware of the severity and impact of mass incarceration, and because of that, little effort is being made to correct this problem. Quite frankly, I am tired of it! We need criminal justice system reform! Mindfulness can be used in the criminal justice system in various settings. Mindfulness in the prison system is possible. 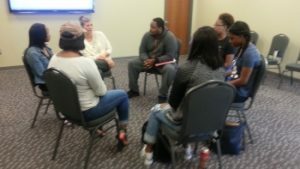 It can assist with the restorative justice process in the juvenile courts Lawmakers can pass legislation that permits mindfulness in the justice system. The Republican Southern Strategy began in the 1950s and 1960s and still impacts voting patterns in the United States today. Maybe we need to choose our presidents based on what they will do to help our communities and the citizens of the United States and not based on race, or political party. Time to end mass incarceration and racism and here is my idea about how that can happen. Freddie Gray, Sandra Bland and Michael Brown were all victims of police brutality and they were all African American. Does that mean their race was the cause of their deaths is a question many are asking. I feel the African American race is being targeted. Our grassroots movement, Peace and Police, is a movement used to strengthen the relationship between the police and their community by ending friction between the two. This Grassroots project will use the Unitive Justice system, so that values and equality, discernment and power, can be strengthened. Conflicts will be solved mutually. Some of the methods the police use today are ineffective and cause an imbalance within the communities they serve. An anonymous Suggestion Box where community members can share their ideas and information is a way to foster communication between the police and community residents. I encourage sexual assault victims to do the right thing: report this violence, or it will never stop. Community policing is a new philosophy of policing based on the concept that the police and citizens can work together in creative ways can solve contemporary community problems. Restorative justice provides an entirely different way of thinking about crime and victimization that can be used in community policing. When will we live in a world where everyone is equal? It isn’t fair that because someone is of a different color they are treated differently. We need Dr. King’s words of hope and inspiration now more than ever! Black girls and women are too often disregarded or disrespected by the media and others due to stereotypes. I’d like to ask people to take a moment to educate themselves about the experiences of women of color, information that is widely available on the Internet and in numerous books.